In my silent moments of reflection about where Raven Rock Ranch has been and where it has come, it astounds me. I am humbled by its tremendous growth as an organization, the many supporters- financially, emotionally, spiritually and good old-fashioned hard work- but mostly in the real value it brings to a hurting generation of kids. I am so very grateful for it all! In the past seven years, I have had many teens tell me that they would not be alive if not for Raven Rock. That stops me in my tracks. I never forget that I am on Sacred Ground when I am here at the ranch. Saving lives, helping children who are in pain find healing, is so much more than I dared to hope for those 7 years ago. But I feel and know that the work we do here is not work we do alone. It is authored by a caring and loving God who has commissioned us to open the gates to all- no matter who they are. All I really bring to this enormous task is obedience, hope and a steadfast belief that we will do great things when we follow where we are led. 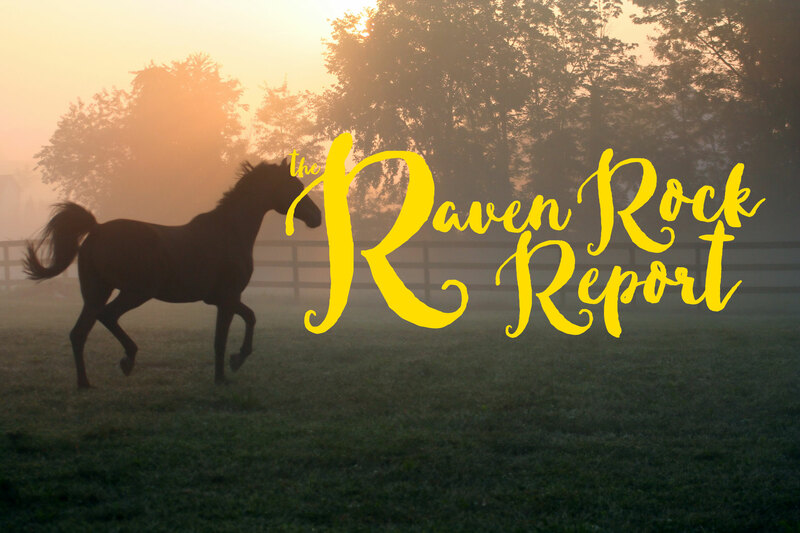 We ALL have so much faith here at Raven Rock; in the horses, the program, each other and the kids who come. There are children who come to the ranch who have been able to stop taking those drugs and cope with difficult life situations. We use an entirely different approach- we use the sensations in their bodies to help them feel that they have some control. They can feel more confident and capable. They can devise plans to cope with stress in a healthier way than they have in the past. When they do this “bottom-up” approach (through their bodies) they retain it because it is intrinsic learning- internal, and not external. Fear is the greatest stressor that we see. We see it in the kids, the parents and the horses. One of our very first children who came to the ranch was a young boy who was adopted from another country. A week after he arrived, we got a new horse at the ranch. He saw her behavior- running hysterically around the area she was in, eyes wide, and it worried him. He asked me, “Why is she so afraid?” I stepped back mentally for a split second. His inquisitive young face immediately grew in wisdom, understanding and resonance. “Yes, it was…” his voice trailed off, feeling her confusion and a sense of knowing that can only come from experience. “Let’s give her some carrots!” he grinned at his solution for her stress. It certainly helped her, and also helped him feel a true connection to another being that knew his fears so well. The very next week, this boy cautiously brushed her (he had been too afraid to touch a horse before this) and, feeling the bond of shared trauma, our new horse leaned into his chest with her head. They both took a deep breath. That is why we adopt horses who have had their share of abandonment and fear. They know our kids and our kids really know them. This year our Annual Dinner netted almost 10X that amount! THANK YOU ALL WHO ATTENDED AND GAVE SO GENEROUSLY! We are SO BLESSED to have you in the Raven Rock Family!